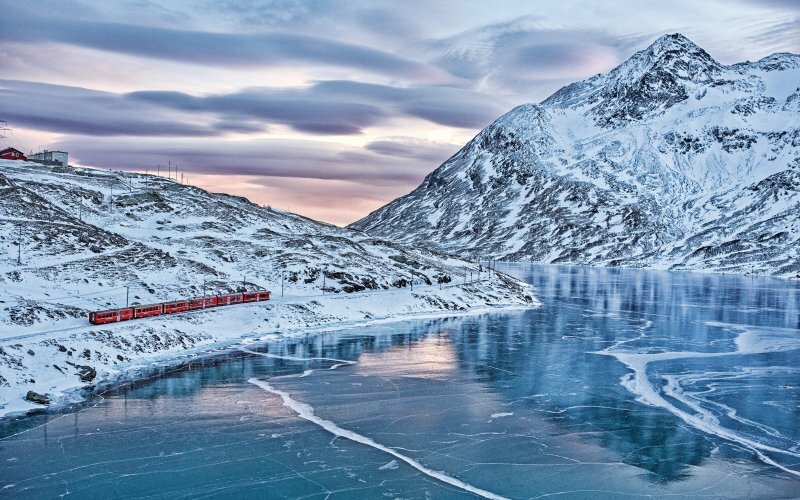 The Bernina Express runs from Chur in Grisons over the Albula and Bernina Railway to Tirano in Italy and is listed as one of the prettiest routes in the world. 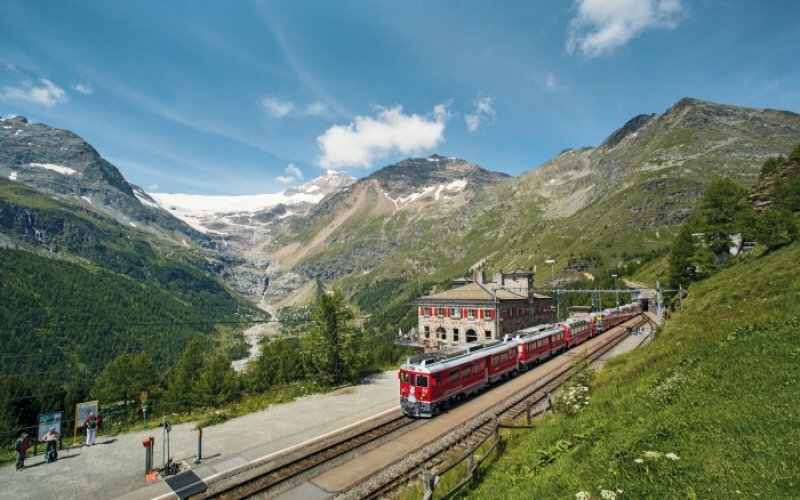 Stay at Alp Grüm, where there's a hotel in the station. 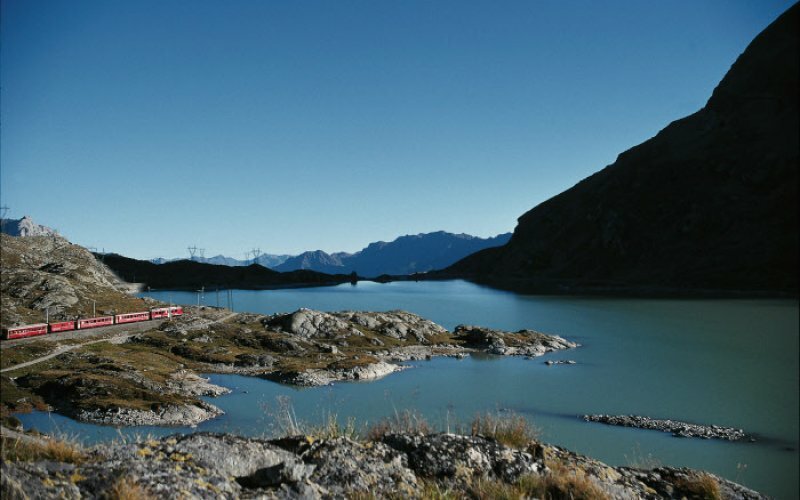 Enjoy the silence and the fabolous sights over the Poschiavo-Valley. 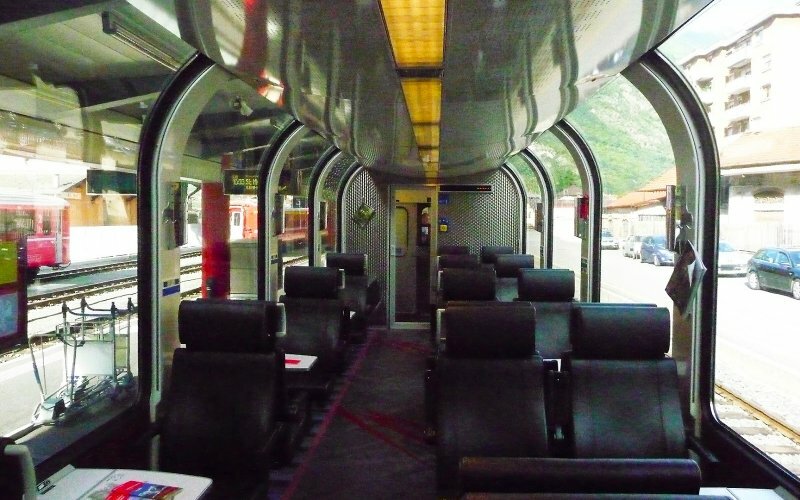 Comfortable seats in bays of 4 seats, 2x2 seats besides the corridor. Multi-langual (including English) information about the sights along the route. 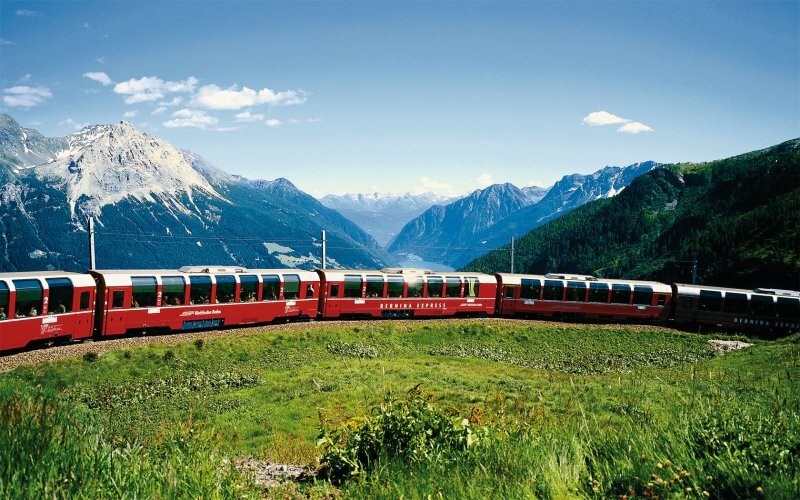 A catering trolley with drinks, sandwiches and souvenirs will come through the train. 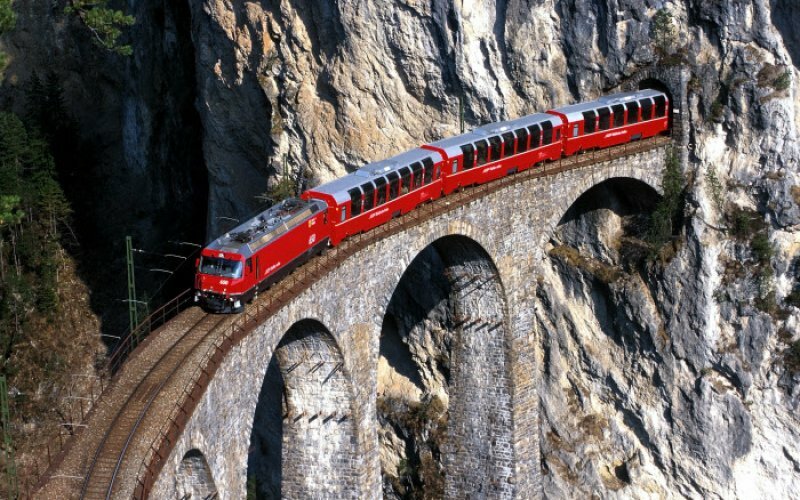 There is no Wifi available onboard the Bernina Express. 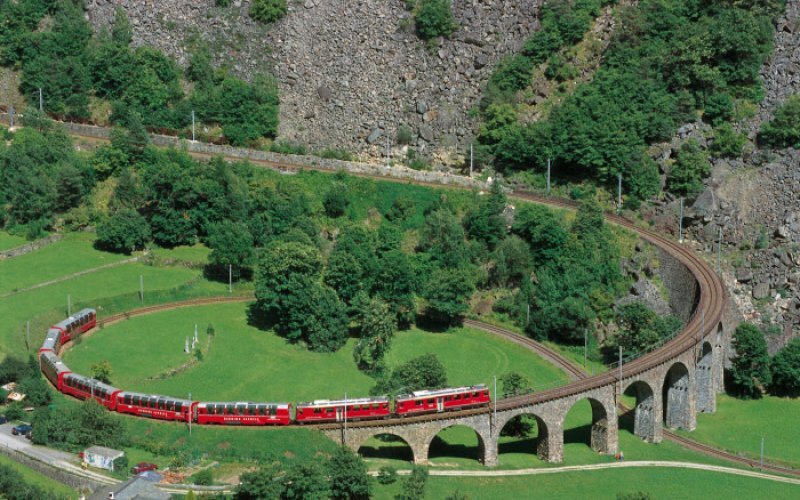 There are no power sockets available onboard the Bernina Express. Children up to 15 years travel for free on a Family Card when they travel with their (grand)parents. This Family Card is for sale at any Swiss train station for 30 Swiss Francs. 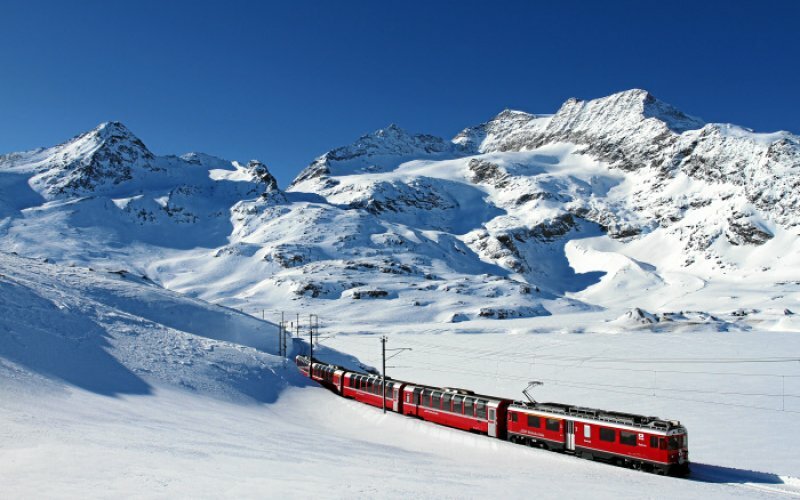 When you're travelling on a Pass of the Swiss Travel System this card is available for free. 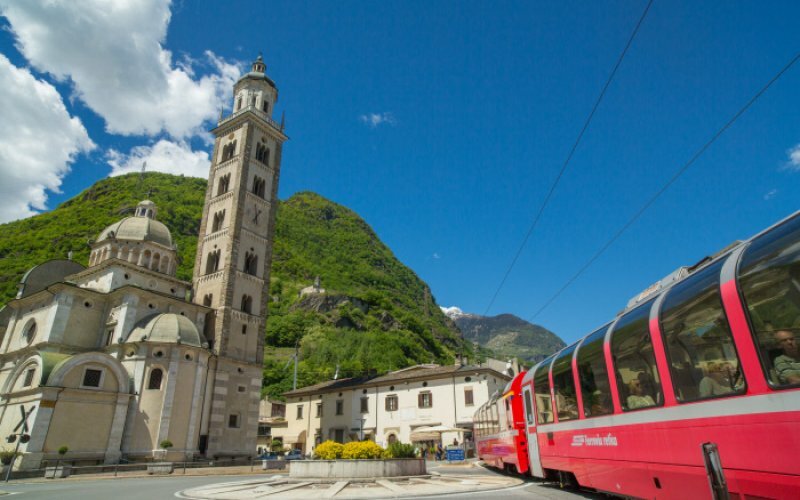 Dogs are accepted on the Bernina Express. Small dogs in a bag or bench travel for free, larger dogs pay half the adult fare. Dogs have always to be on a leash. 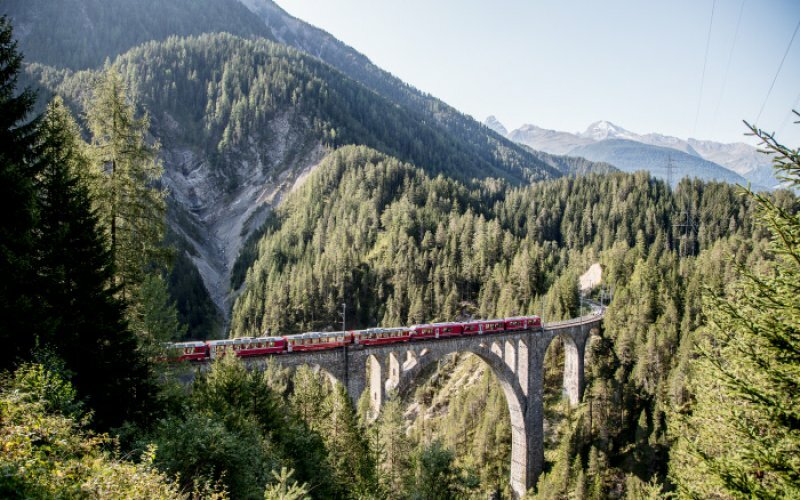 There is no luggage limit onboard the Bernina Express. You can place your large suitcases at the special luggage racks near the outside doors and hang your coats at the wardrobe next to it. Of course, its advisable to take your items of high value to your seat. 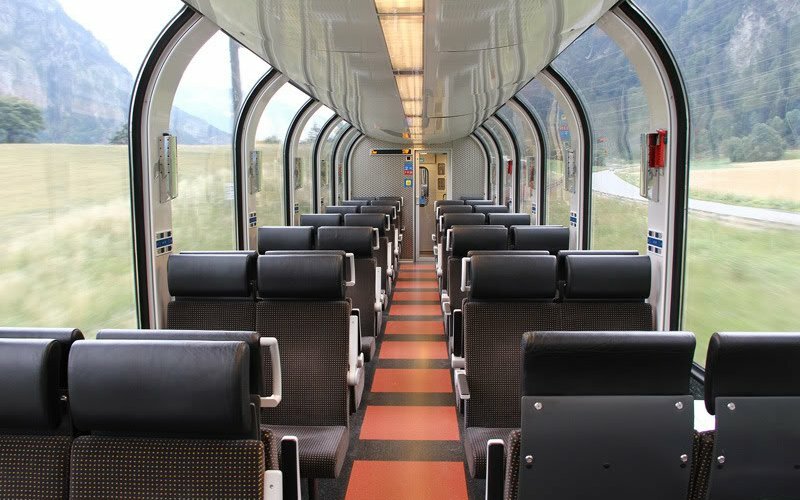 You can board the train at any time before departure. 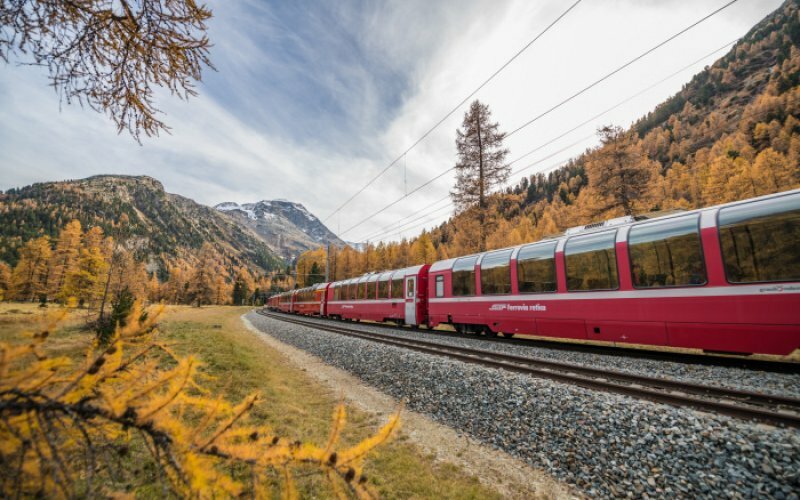 Please note that the Bernina Express is coupled to a regular train between Chur and Samedan in the low-season (October-May). 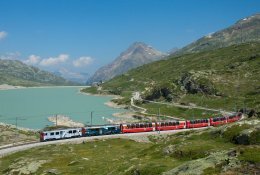 In this case the Bernina Express-coaches will be designated at the train indicators or ask a member of staff where to stand on the platform. 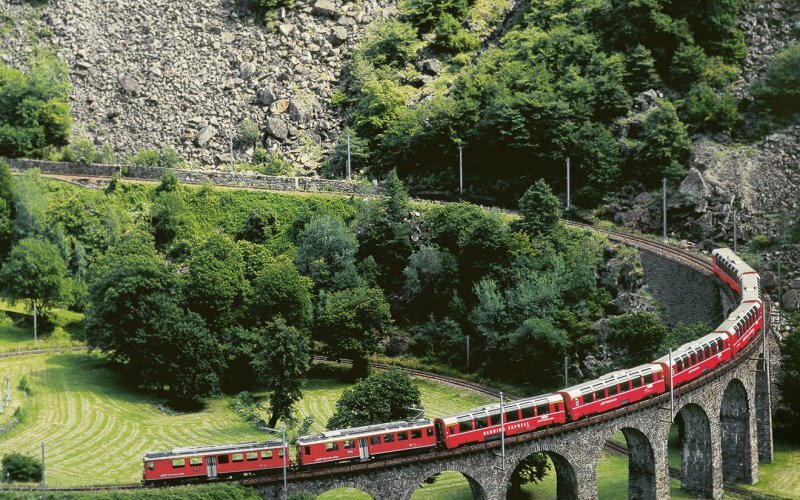 When you're making more train journeys within Switzerland it's advisable to book a Pass of the Swiss Travel System. 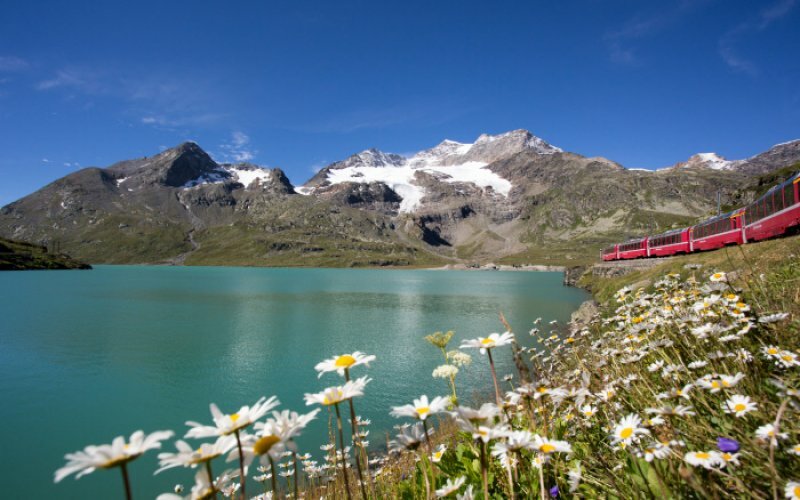 Interrail and Eurail are only valid on the entire route of the Bernina Express. You only need a seat reservation including supplement. 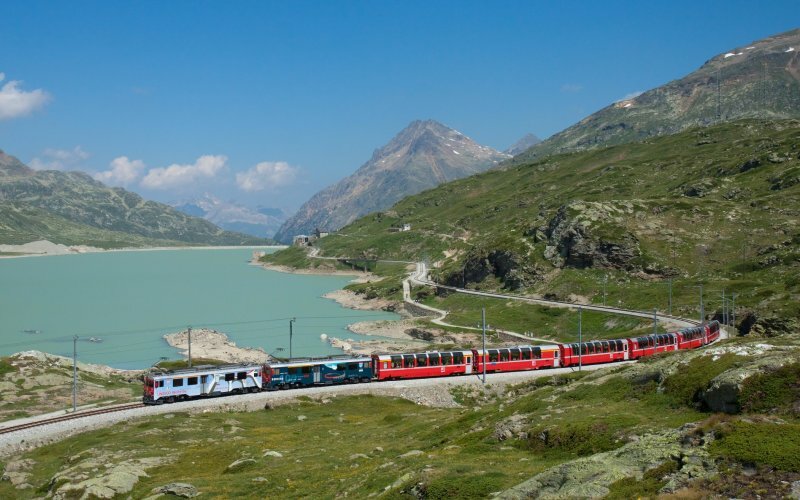 For groups from 6 persons we offer special group fares, see Group travel by train. 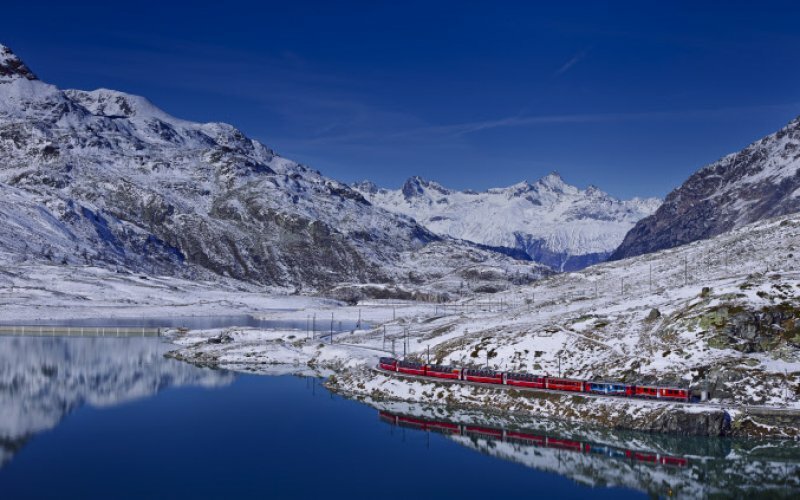 The Bernina Express could be a great incentive for your business partners to discuss business in the beatiful settings of the Bernina Railway. 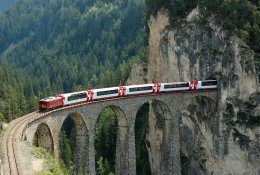 See Business travel by train. 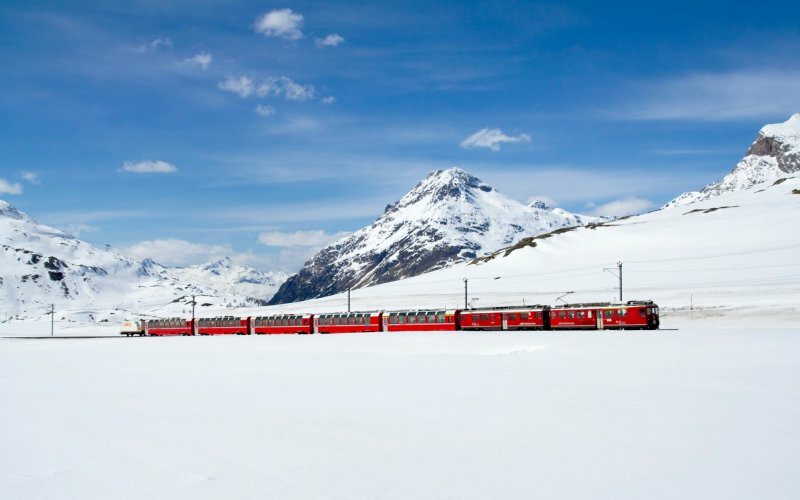 All Bernina Express-stations offer heated waiting rooms for both first and second class passengers. Most stations have a restaurant or shop for refreshments.